I can concede that you're probably right, but not to sound nasty, I don't really mind that it may not be a perfect match. I'm out of ideas for colors, so if someone wants to take a little of that thinking off of me, then hey, I'm all for it, I'm busy with other things anyways. At the same time, recall a recent thread I started somewhere with LED inconsistency. So, getting a "perfect match" may also be an issue. I won't argue matching up LED's to known gel standards using bulbs that use a standard color temperature as well(and hence work better with the gels as a result). It's absolutely necessary. At the same point, on shows I'm working with, I don't have the time to set up my lights and match up, as well as lacking the proper experience and knowledge to know how to adjust properly to match things up. I gotta set them up and go. In my case, close works. With the RGB values, this sure is a helpful bit of advice. Actually I saw that as well. But I thought I saw it on the TRI-LED series. For example the FLAT PAR TRI18, or the FLAT PAR TRI7. Because honest to say I did try that chart but results were kinda sketchy to say the least. Maybe because I tried it on American DJ Mega Pixel LEDs. But hey what do I know. I am just some bedroom lighting tech/DJ. Hey guys. My intention for posting that chart was simply for you all to get an idea and play around with new colors. 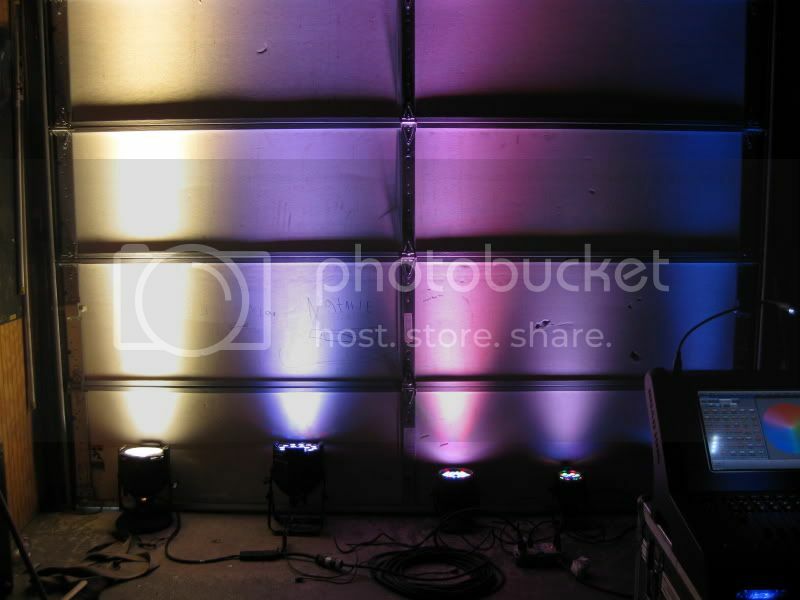 Yes those values are best for TRI led fixtures but you can get a little close if you play around with the colors on reg. RGB led fixtures. Hello I am new to the board and semi new to DMX lighting. I was hoping someone can help me out I am trying to find the DMX values for a Dark purple color and a Dark pink color using ADJ Mega Par profiles. I have a Mardi Gras party and a All Pink 40th Birthday coming up and I am trying to achieve the right colors for this event. Thanks in advance, If i can help on any other topic such as Serato, 57SL, Mix Emergency or video mixing just drop me a line. 2 AM bored listening to The Killers Greatest Hits so I figured I would pop in . Anyway, a dark purple will have blue at full and just a touch of red. The shade of blue LED you have will be the limiting factor in the darkness of the purple (regular or royal). As for a dark pink, that will be a combination of red and blue, most likely more red than blue. So I would start with red all the way up and add blue till you get what you want. If find the hue of purple and/or pink you want but it is a little too dark, add a bit of green in to lighten it up. 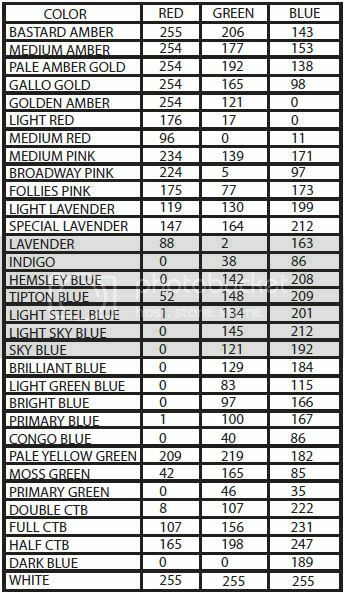 As for white and amber LEDs, they only really help in making pastel colors (pale pinks and purples, light lavenders, ambers, and blues) and a 'true' white. The white LED generally helps more than the amber one unless you are looking for a specific orange or amber. Green and red LEDs get to a point which they almost seem to snap from amber to yellow. The amber LED helps with that. What I generally use LEDs for (backdrops, overhead lighting, back lighting, effect lighting), I generally can't get enough saturation so even fixtures with white and amber LEDs in them, I almost never use them. So I wouldn't be too concerned about not having white and/or amber LEDs, especially since you are looking for high saturation like me. Well I have been humbled and corrected by the "PRO" haha. Thanks Serra! Thanks for the info, I have been playing around with my traditional DMX controller and a Obey 4 all night going back and fourth. The small problem that I have now is that I own 10 Eteranl Lighting Flat Par Pros(RGBA) and 10 ADJ, Mega Par Pro. The only colors that I can get to match is the red and green anything after that there is a noticeable difference. I wish i would have bought 10 more ADJ mega par pros. 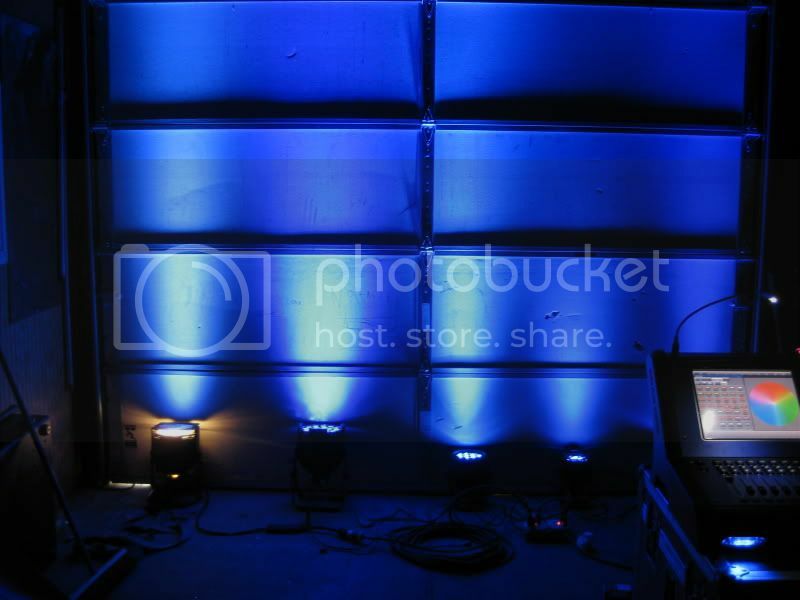 Not just becuase this is a ADJ website the colors are alot darker and richer, and the when shined on a wall or ceiling the projection is alo tighter than the Flat Par Pro. I am going to put these FlatPar Pros in Ebay immediately and go wih the ADJs. I wonder if I can purchase a 10 pack package. Thanks again for your help. Ya that is kinda what happens when you try to mix and match different manufacturers products into a single show. Sorry. There's a couple other places that list rgb values to produce a color. There's also CMY if you need that. But the output will ALWAYS need some user adjustment because the lamp/diode will not be 100% dead on, the surrounding colors will impact what you see, etc. It's a guide, not a law. Remember the whole reason for having CONTROL is because YOU are in control of the lights, not the other way around.